The last Razor branded product should be coming out at the end of August, if not sooner, Brian Gray said on Twitter. 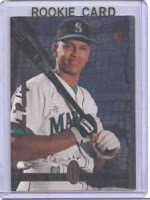 Razor Rookie Retro is a set of some of the most popular graded rookie cards of the top players over all sports. Gray bought the 2010 Bowman Stephen Strasburg superfractor when it was re-listed and bought it for $21,403 exclusively for this set. 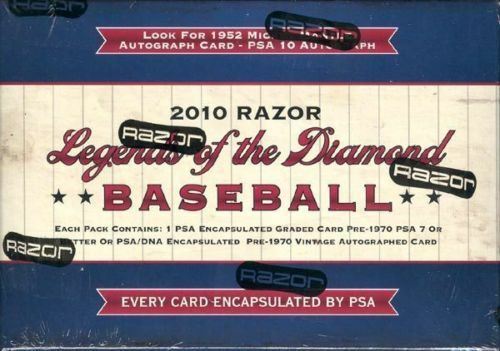 Razor had success with a similar product, Legends of the Diamond , where every card is slabbed by PSA. The boxes go in the $200-plus range and include one pre-1970 vintage card. There is no checklist yet for Razor Rookie Retro, probably because cards are still being bought. However, if you look at this eBay account (hint, hint), you will get an idea of what cards will be included. Some of the rookies include Alex Rodriguez, Michael Jordan, Lebron James and 2007 Jason Heyward superfractor. Like every hobby box, these boxes are a gamble. While at the National, I saw two Legends of the Diamond breaks. One had a card that was immediately sold for $60 (after paying $200) and another had a 1969 (I think) Nolan Ryan. Gray has said the average return on the Rookie Retro boxes will be around 80 percent of factory cost across the print run. As of Monday night, pre-order boxes are going for $219 on Atlanta Sports Cards. Gray has purchased money cards from collectors to fill this as well. At the National, many sold graded cards of well-known players and some of today’s hottest prospects. Imagine if they opened this product and got their own card back. Ha! In other good news, Gray also said the boxes will have security stickers in hopes of preventing tampering. While this set is out of my price range, I am looking forward to seeing some of the breaks of this product. Update: View the checklist here. Should be a really popular break. Great that it was protected from tampering.. That must be a great set of sick cards.. Looking forward in this..